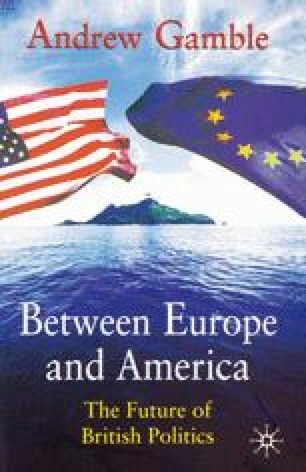 In the last twenty-five years the choice between Europe and America has come to dominate the future of British politics. It has done so at a time when many long-established features of the British political landscape have been uprooted or refashioned. Many more are in process of renovation and modernization, and the changes are far from complete. The British have been busy grubbing up old interpretations of their past, and a new landscape is coming into view, but its shape owes more to accident than to rational design or political intention. In the recent past there have been projects of both right and left to change British politics, and charismatic leaders, Thatcher and Blair, but the outcomes have often been very different to the ones their authors intended. Politics often proceeds through muddle, confusion, and accident, and recent British politics has been no exception. Yet even if politicians rarely achieve what they hope, they can on occasion be the unwitting agents of far-reaching change. Until recently, English historiography resembled the work of a landscape gardener at a stately home; vistas of Saxon lawn and Norman shrubbery led up past Tudor and Hanoverian flowerbeds to the terrace of the present, where the proprietor sat contentedly surveying his estate. Other countries are restless, grubbing up old interpretations in each generation.